Thanks to our friends at al fresco for sponsoring this yummy Instant Pot recipe… Instant Pot Mexican Quinoa and Chicken! 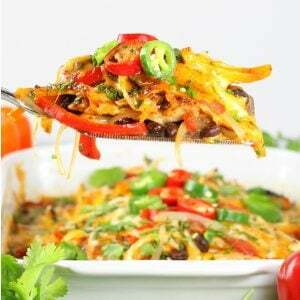 This one-pot, gluten-free, zesty meal is on the table in less than 30 minutes! 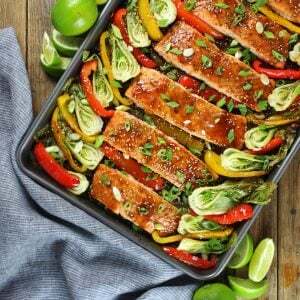 It’s the perfect recipe to meal prep for the week or for any busy weeknight dinner. 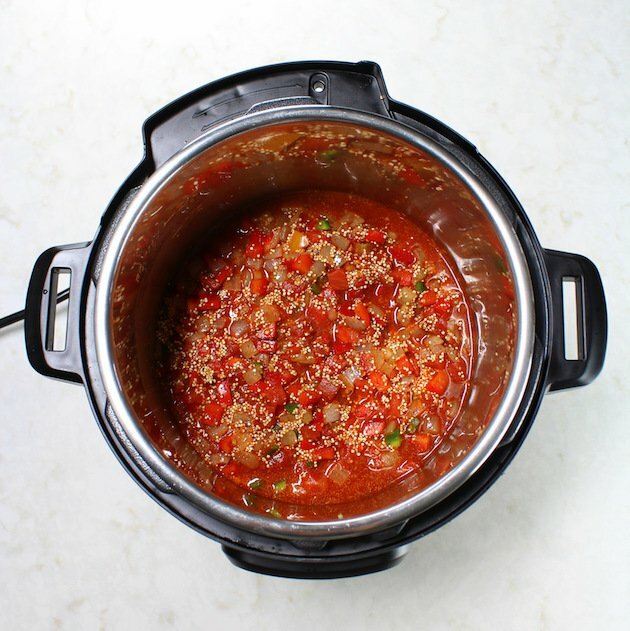 Have you tried cooking quinoa in your Instant Pot? Ahh-mazing! It’s so quick and I love that the Instant Pot takes all the guesswork out of perfectly cooked quinoa. 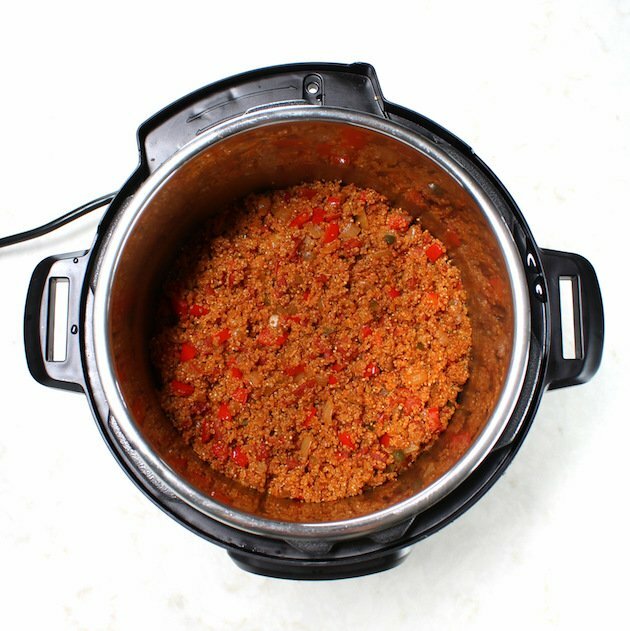 Yes – Instant Pot Quinoa is where it’s at my friend. Buuut I’m happy to report that I’m now a quinoa instant pot cooking boss!! Yes – the IP has redeemed my quinoa cooking reputation. I was so excited about my new-found skills I had to show them off! So here we are talking about this yummy Instant Pot Mexican Quinoa and Chicken! 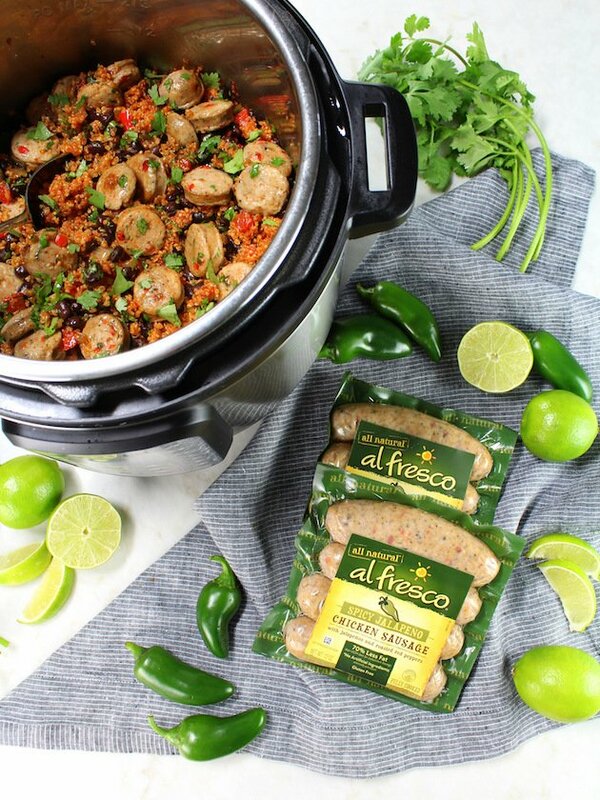 This recipe is chock full of all kinds of healthy goodness like sweet peppers, black beans, diced tomatoes, fresh onion, garlic, Mexican seasonings, and THE most delicious Jalapeno Chicken Sausage from our good friends at al fresco. 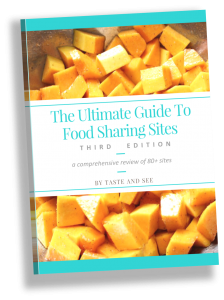 Trust me – this is going on your list of must-make easy quinoa recipes! Sooo good! 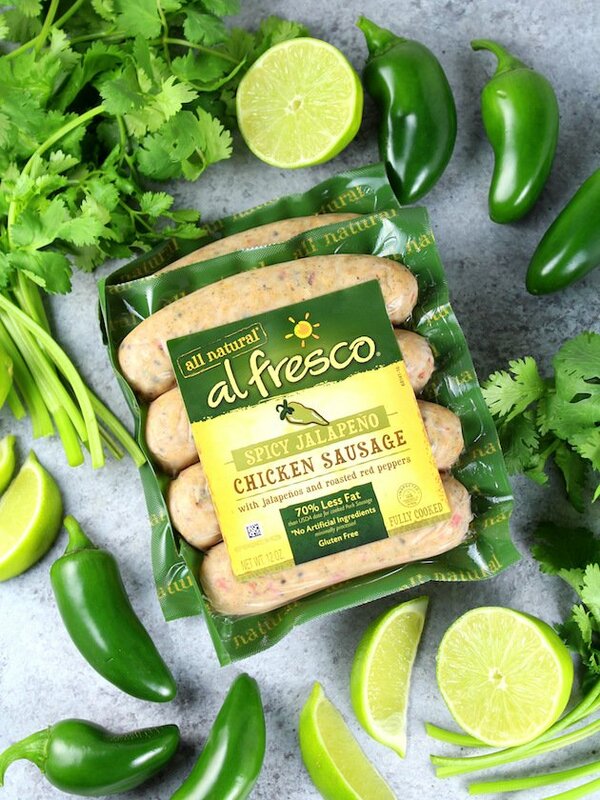 al fresco’s Spicy Jalapeno Chicken Sausage is so flavorful and zesty with just a hint of spice, red peppers, jalapenos, and herbs. 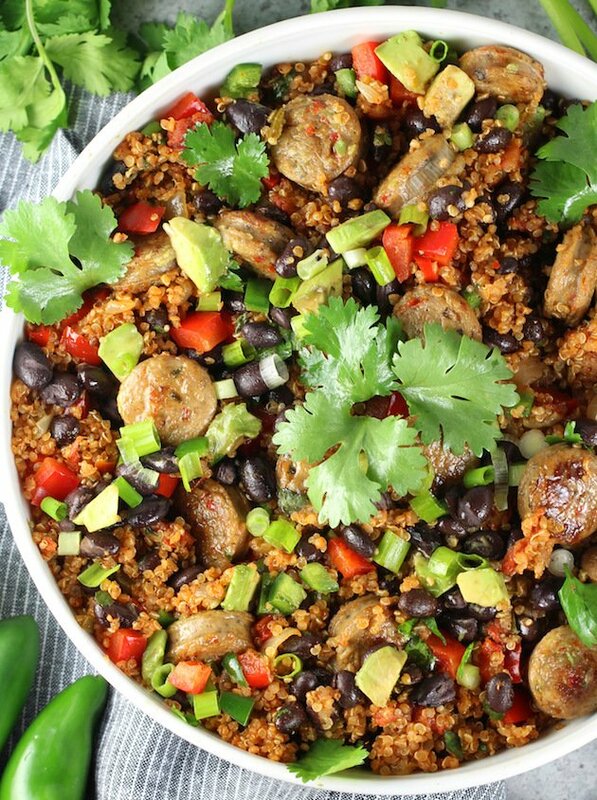 It’s gluten free, has no preservatives or artificial ingredients, and comes precooked so it’s the perfect choice for this quick and easy Mexican quinoa meal. As you can probably tell I’m a huge fan of al fresco chicken sausage. Not only is it convenient but it comes in so many amazing flavor combos – making it the perfect chicken swap for any dish you make. Like this Grilled Romaine Salad, Orzo Chicken Marsala, and Buffalo Chicken Mac and Cheese! AND now this Mexican Quinoa with Chicken and Veggies! Quinoa is referred to as a grain, but it’s really a seed. It’s truly a standout among all grains and seeds because it’s higher in protein than any of them. Quinoa protein is considered a “complete protein,” meaning it contains all the essential amino acids our bodies can’t make on their own. One cup of quinoa contains 8 grams of protein. The Quinoa nutritional value is pretty significant. The same cup also contains 5 grams of fiber. All of this is much more than you’d get with a lot of other “grains” – and it even gives you a vitamin boost containing over 10% of the RDA for vitamins B1, B2 and B6. Another thing that makes quinoa so special is that it’s easy for your body to digest and it is gluten free. Plus, it’s easy to find non-GMO and organic versions. One cup of quinoa contains about 39 grams of carbs. 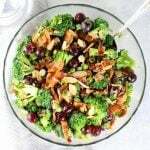 That is on the high side but the quinoa glycemic index is considered low at 53 (Foods with a GI of 55 or less are low-glycemic). So it won’t spike your blood sugar like other high carb grains. Well… probably not. 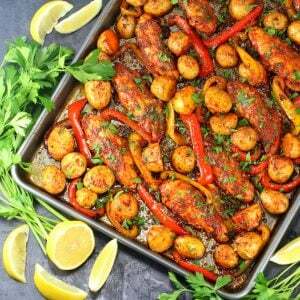 The paleo diet consists primarily of meat, seafood, nuts, seeds, non-starchy vegetables and fruit. 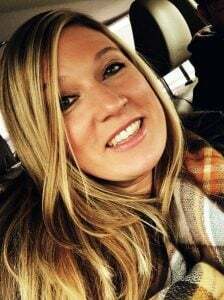 Paleo purists do list grain-like seeds such as quinoa as “foods to avoid.” Although, some people following the Paleo diet still eat quinoa and other pseudo-grains as grain alternatives. Okay, quinoa school is over. 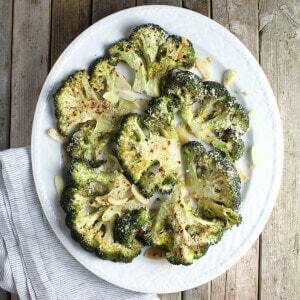 Now that you know the back story of this grain-like seed, let’s talk about cooking this yummy recipe! Usually quinoa requires a 2:1 quinoa to water ratio for stove top cooking. In the Instant Pot, it’s a 1:1 quinoa to water ratio. So, one cup of liquid to one cup of dry quinoa. I like to rinse my quinoa before cooking. Quinoa has a natural coating, called saponin, that can make it taste bitter or soapy when cooked. It’s easy to get rid of this coating by rinsing the quinoa just before cooking. Most often, boxed quinoa is pre-rinsed, but I like to give the seeds an additional rinse to be sure. Before we cook the quinoa in the IP we’re going to sauté the jalapeno chicken sausage in a little olive oil on the sauté mode for about 2 minutes per side. Just enough to give it a little color. Then remove it from the IP with a slotted spoon and set it aside. Next, with the IP still in the sauté mode add in your garlic and onions, stir and cook for 4 minutes. Now add all of the other ingredients except for the lime juice, cilantro, black beans and chicken sausage, then cover and lock down the lid. Turn the pressure setting on and set it to 10 minutes (it will take about 6-8 minutes for the IP to pressurize before it starts cooking). Once the 10 minute cook time is up, manually (and carefully) move the steam release valve to the “Venting” position. After the steam is done releasing, remove the lid and fluff the quinoa with a fork. 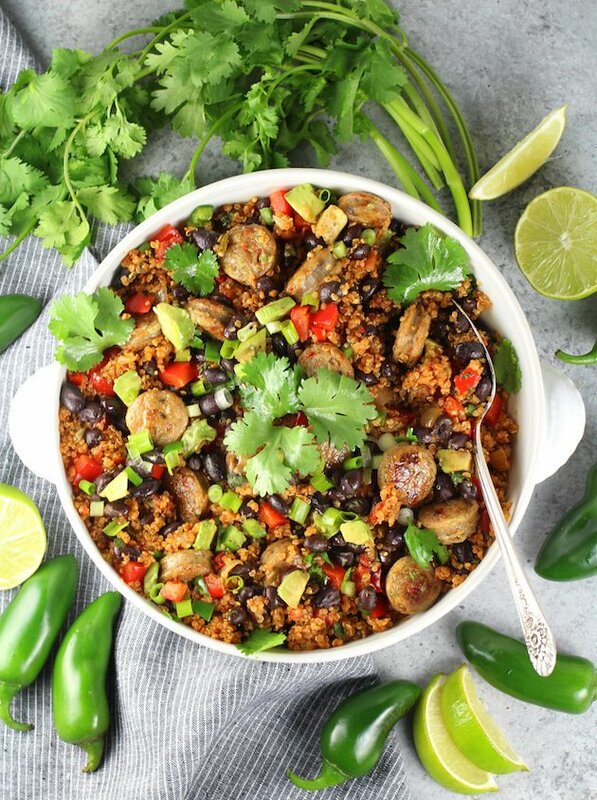 Now fold in that al fresco jalapeno chicken sausage, the black beans, cilantro, and lime juice, then garnish with any of your favorite toppings and enjoy! This is such a healthy and delicious 30-minute meal. Instant Pot Mexican Quinoa and Chicken – perfect for those summer days when you rather be playing in the sunshine and not standing over a hot stove! Now that’s what I call winning! 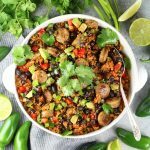 Instant Pot Mexican Quinoa and Chicken! 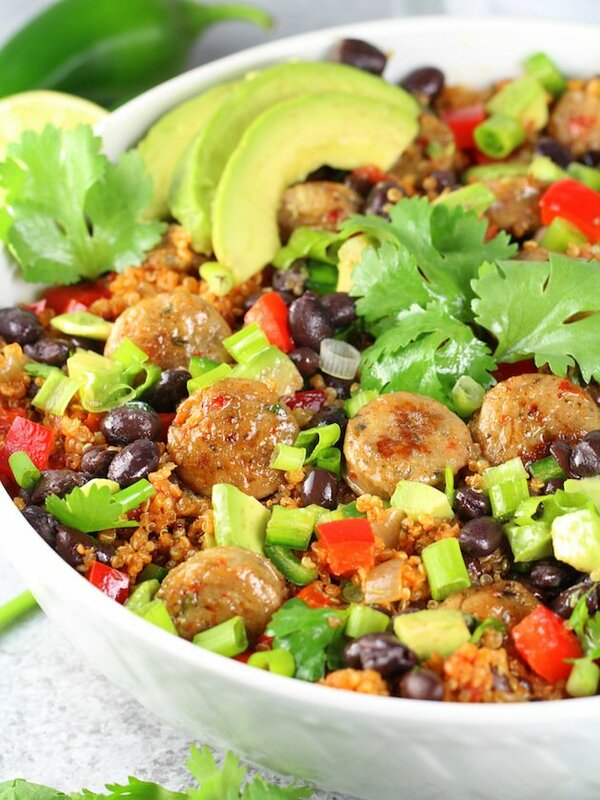 This one-pot, gluten-free zesty meal is on the table in less than 30 minutes! Thoroughly rinse quinoa in a sieve before cooking. 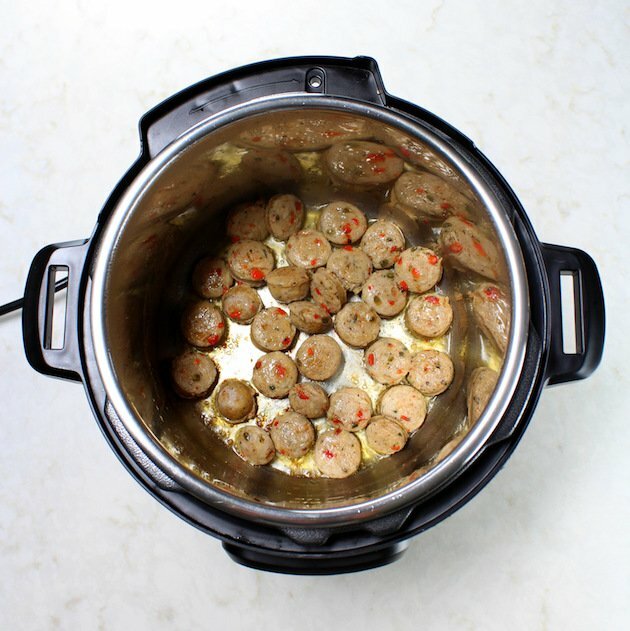 Slice the jalapeno chicken sausage into one-inch slices, then set Instant Pot on sauté and add olive oil. Sauté the sausage for 2 minutes per side, then remove it from the IP with a slotted spoon and set aside. With the IP still in the sauté mode, add minced garlic and chopped onions. (There should still be olive oil and juices from the chicken sausage in the IP, if it seems dry add more olive oil.) Stir and cook for 4 minutes, then turn the sauté setting off. 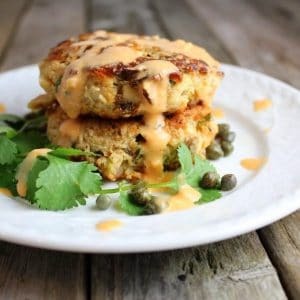 Add all other ingredients except for the lime juice, cilantro, black beans, and chicken sausage. Cover and lock down the lid, turn the pressure setting on, and set it to pressure cook for 10 minutes (it will take about 6-8 minutes for the IP to pressurize before it starts cooking). Once the 10 minutes is up, manually (and carefully) move the steam release valve to the “Venting” setting. After the steam is done releasing, remove the lid and fluff the quinoa with a fork. Fold in chicken sausage, black beans, cilantro and lime juice. Garnish with your favorite toppings: cilantro, avocado or guacamole, green onions, jalapeños, cheddar cheese, sour cream, salsa or salsa verde. Looking for more amazing Instant Pot Recipes? Yay for having more quinoa in your life! And yay for this amazing delicious dinner – you know a one-pot meal that’s ready in under 30 minutes is totally my style! Plus, my whole family loves the al Fresco sausages so this is definitely going to be a hit! I love hearing that, Kathryn! 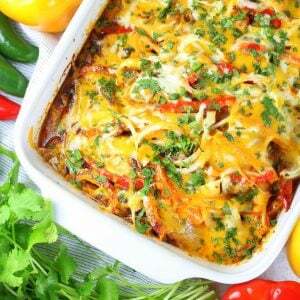 This is one of those delicious and easy recipes that will be in the rotation forever! Oh, yay! 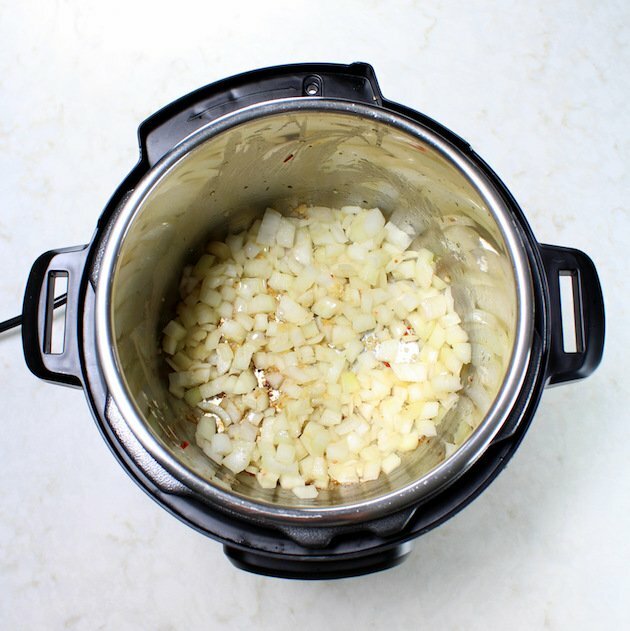 Another Instant Pot Recipe to try! Plus, I love quinoa! Same here, Erin! I’m always looking for new IP recipes myself. Enjoy! 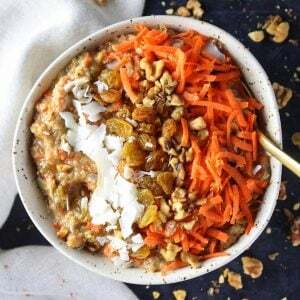 Oh how I love quinoa, al fresco, and my Instant Pot…so this is a MUST make for me. And for me the IP saved me when it came to cooking rice…it is a grain super cooker. Thanks so much, Kristen! I share your fondness for those things as well. 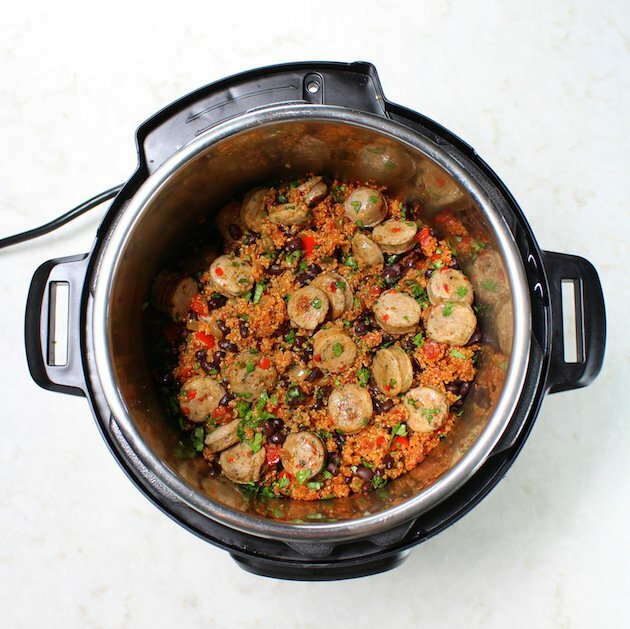 Instant Pot Qinua Cooking Boss in the HOUSE! Haha. Looks good.